Sun Peaks Resort, is one of our top three favourite resorts in British Columbia, as it really is “all things to all people.” It proudly boasts Canada’s second largest ski area — Whistler is the biggest. It is inland from Vancouver (YVR) — around 4.5 hours by road and serviced by two airports: Kamloops (YKA) and Kelowna (YLW). This purpose-built resort offers up 135 designated trails; some of the best glades in Canada; plus an interesting and varied mix of terrain for all abilities. With more than 2000 hours of sunshine each year, the resort has earned itself a well-deserved reputation as a family favourite; in addition to being a specialist wedding destination; and ski race training venue. Importantly, the accommodation options will suit all budgets. Most are ski-in, ski-out; spilling straight into the pedestrian, ski-through village. Après ski more your scene? Sun Peaks ticks that box too. The resort truly has almost every imaginable winter activity on offer: go mushing on a Sun Peaks dogsled tour, embrace your inner adventurer with Sun Peaks snow-biking or join the mountain operations team for a Sun Peaks snowcat groomer ride. And when it’s your “me” time, luxuriate and be pampered at one of the Sun Peaks Day Spas. The choices are endless. To sum up, we love Sun Peaks Resort. This resort is one of our top three preferred family destinations in British Columbia, along with Whistler and Big White. Nancy Greene was instrumental in the development of Sun Peaks. A former Olympic Champion, Canadian Senator, and Sun Peaks’ Director of Skiing, Nancy makes her winter home here, at the Nancy Greene Cahilty Lodge. Nancy Greene was Canada’s top ski racer through the 1960’s, winning gold and silver medals at the 1968 Grenoble Olympics, and overall World Cup titles in 1967 and 1968. Her total of 13 World Cup victories is still a Canadian record. She won 17 Canadian Championship titles in all disciplines. She enjoys skiing with guests on most weekends and holidays. This is a once in a lifetime opportunity to ski with an Olympic champion, and a gracious and amazing lady. It’s the quality not quantity of snow that speaks for itself at Sun Peaks Resort. Let us explain. Many of the cut runs are grassy and meadow-like in the summer; and therefore don’t require massive early season snowfalls for building the snow-base. The added bonus is the “Interior” British Columbia location — which provides for lighter and drier snow, than you may find on the West Coast. This applies to a few resorts in the “Interior” — a fact worth remembering if you are a powderhound seeking out the knee-deep, light, fluffy champagne powder, the region is renowned for. The resort historically averages an annual snowfall of around 237 feet (6 m). This is more than ample for snow enthusiasts of all abilities to enjoy everything Sun Peaks has to offer: deep steeps, long cruisers, exceptional gladed areas, powder stashes, and the consistent corduroy groomers. The size and scale of the resort’s terrain, belies the intimate Tyrolean style snowbound pedestrian village that is nestled in the valley of the three mountains. The clever design of the entire resort, means you are never far from the village, nor the chairlifts. The village is relatively small. Accommodations sit side by side with retailers, offering more than enough choice of essential retail shopping, cafes, bars, restaurants. Access to ski school and rental shops is a breeze. There is even an art gallery. Pedestrians and skiers share the snow-covered streets, whilst vehicles are relegated to perimeter roads. It’s a safe village where children can frolic in the snow, build a snowman, or pop into the Rocky Mountain Chocolate Factory — a family favourite. It takes approximately 10 minutes to walk (in ski boots) from one end of the village core to the other. Townhouses and chalets are generally another 5-10 minutes’ walk from the village. Sun Peaks is fun, easy, and reliable. Plenty of fabulous activities on and off snow. Easy to access; easy to ski and snowboard all three mountains in one day; and easy to enjoy the après ski activities. The resort is first rate and reliable: consistently good snow; excellent quality accommodations; exceptional ski school and mountain operations. We would recommend for your first visit to Sun Peaks to allow at least 4-5 days to really discover this wonderful jewel of British Columbia. Stay longer if you can. Book Now! To better understand the accommodation options that will work best for you, it helps to visual the village, and how the three mountain bases come together, in the Sun Peaks Village. Download the Sun Peaks Village Map. Being a purpose designed and built resort, we can thank the planners for their vision, ensuring ski-in, ski-out accommodation options, and ample variety of accommodation to suit all budgets and needs. From luxurious self-contained vacation homes; a cozy condominium; more modest hotel-style rooms; or a welcoming deluxe hotel suite, complete with ski valet services. In the heart of the village, you will mainly find mid-range and luxury condominiums and hotel rooms. As the resort expanded in the past decade, some of the new properties offer 5-star amenities. Larger chalets and townhomes are located generally around the perimeter of the core of the village. Many are ski-in, ski-out to various chairlifts. Around the perimeter, we particularly like the ease of access in the area around Sundance and Bella Vista Drives and ski access to the Morrisey Express Chairlift. The Sun Peaks Grand Hotel is pet friendly; and pet friendly studios are also available upon request at Coast Sundance Lodge. #1. It’s vast, yet intimate; and ticks the box for everyone. Being Canada’s 2nd largest ski resort, there is a huge diversity of terrain across three interconnected mountains. Each winter, these peaks are covered in the renowned light and dry “champagne powder” snow, the Interior BC resorts are famous for. 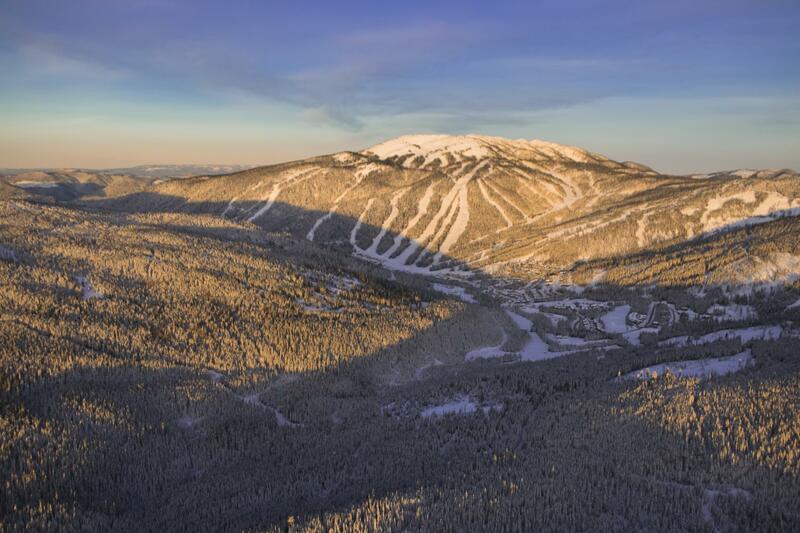 The numbers speak for themselves: 4270 acres (1728 ha) of skiable terrain; 135 named runs; as well as a 10 acre (4 ha) Terrain Park. If you are a double-black powderhound, then Chute is your go-to run; or for the mellower, head to the Mt. Morrisey glades. You will find everything from steep and deep; to perfect corduroy groomers; and hero-snow as the name implies. Did we mention? No lift queues. With the exception of Christmas, crowds are virtually non-existent. Sun Peaks also offers an expansive system of some 22 miles (37 km) of dedicated, groomed Nordic trails. For something truly unique to Sun Peaks, Nordic enthusiasts can hop aboard the Morrisey Express chairlift; for exceptional access to seemingly endless backcountry terrain, and scenic mountain views off the Holy Cow trail. If you are new to Nordic, sign up for the Glenn Bond Nordic Ski Camp; or take the entire family on a cross-country ski to a charm-filled warming hut. #2. Easy access, easy to ski, easy for every conceivable après activity. One of the most appealing aspects of Sun Peaks, is the cleverly designed flow of the village and resort. There is an intimacy, sense of scale and feeling that everything is manageable, and within easy walking distance. Add to this, the true ski-in, ski-out accommodation, it all adds up to a family-friendly, safe, easy to get around place, where nothing is more than 10 minutes’ walk away. It is the closest Interior BC resort to Vancouver. With gateway airports at both Kamloops, and international airport Kelowna, Sun Peaks is accessible from around the world. There is a very regular, daily airport-resort shuttle service. Within the resort, if you are feeling a little lazy, a local will get you around Sun Peaks Resort, on-board the super-easy intra-resort shuttle service. Sun Peaks meets the marque for après as well. For the fishing enthusiast, try your hand at guided ice fishing tours. Families can get their skates on the NHL-sized outdoor skating rink; explore the backcountry snowmobiling; or take a winter segway tour. The choices are virtually unlimited. #3. A Wine Festival with a twist. We’ve been lucky enough to be at Sun Peaks, during the fabulous Sun Peaks Okanagan Winter Wine Festival. This intimate festival is a gem; if you can plan your travel for mid-late January, you will hit the jackpot. The festival spans 10 days; bringing the best of local wine and winter sports together, whether you are a snow enthusiast, wine buff, or an après skier. In the past decade, the Sun Peaks Winter Wine Festival has earned a well-deserved reputation as a must-do event, evolving into a very impressive festival. There is no shortage of seminars and activities; and a myriad of wine tasting and food pairing events dotted around the village. Make sure you partake in the unique Progressive Tasting, which incorporates 30 or so wineries dispersed throughout the village. You wander, glass in hand, tasting from station to station. Bring your après boots, as remember the village is snowbound for pedestrian only traffic. SNOW HOW TIP: The Sun Peaks Winter Wine Festival events sell out fast, so book online early. If you travel plans don’t align with the festival, Sun Peaks will delight your taste buds with a Fondue mid-mountain dinner or the ever-popular Sun Peaks First Tracks Breakfast. #4. 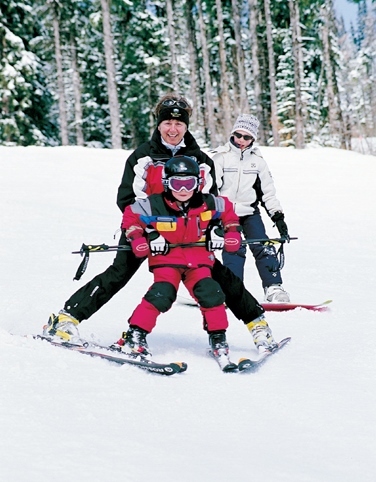 Sun Peaks has quickly become a very popular wedding and multi-generational snow vacation destination. We’ve already commented how good this resort is for families. It’s equally as superb for couples, groups as well as singles on a road trip. There is enough après ski to keep you well and truly entertained. 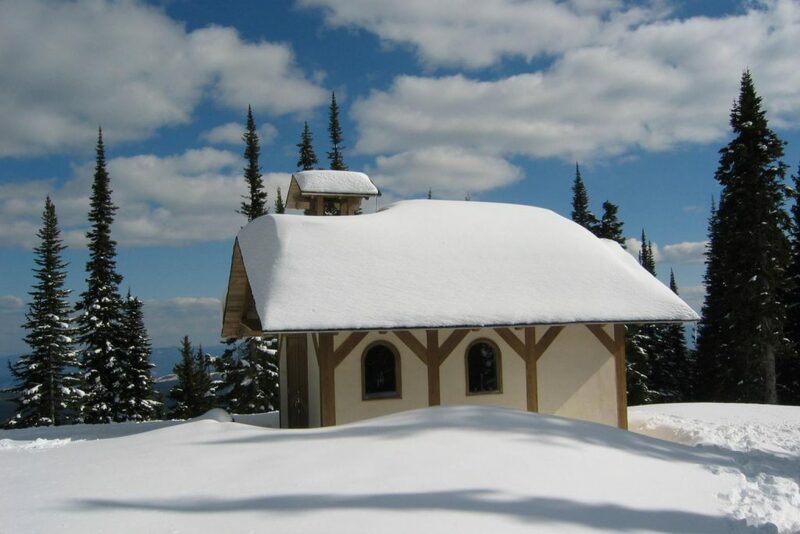 The resort has some ideal venues for special events, specifically Sun Peaks weddings — the stunning chapel, perched mid mountain, overlooking this winter wonderland is truly special. #5. Racers ready….Did you know Sun Peaks established the Nancy Greene International Race Centre? It is a world-renowned purpose built venue providing the very best training facilities, terrain and technology. Even the Austrian Olympic Ski Team trained here before the 2010 Vancouver Winter Olympics. Each year, race groups across the competitive spectrum from school groups to Olympic athletes, make Sun Peaks their race training winter home. Speaking of racing and Olympics, you also have the opportunity to get up close and personal with an Olympic Ski Champion — Nancy Greene. This is the only resort we know of, that week in, week out, allows guests the opportunity to meet and ski with an Olympic champion. Even if you’re not a keen skier, you can admire her cabinet full of medals and trophies on display at her Sun Peaks home, and accommodation lodging – Nancy Greene’s Cahilty Lodge. Sun Peaks Resort offers 22 miles (37 km) of impeccably groomed and track set trails which are accessible right from the village and your accommodation. Cross-country ski or snowshoe with the entire family—including the dog—on the pet-friendly route to the McGillivray Lake outpost warming hut. For the adventurers, access the 10.5 miles (17km) of stunning backcountry trails and wilderness from the summit of the Morrisey Express Chairlift. The resort also hosts a Nordic Festival each March, with a family-oriented cross-country series of races. Not offered, just lots of après activities! Sun Peaks is usually open from late November to mid-April each year. You’ve gotta love the name. Sun Peaks’ giant 10 acre (4 ha) top-to-bottom Rockstar Energy Terrain Park runs the entire length of the Sundance chairlift. It does not disappoint. Oozing a myriad of jumps, rails, boxes and features; it’s groomed to perfection each night — ready for you, each day. Dedicated snowmaking allows the park to open early each season, with the ops team constantly changing up the park, to keep you on your toes. The Platter Terrain Park is accessed with the Village Platter and open later into the evening, featuring a rotating mix of small features that are fun for just about anyone. This zone is definitely for the thrill seekers. Extra-large features set the challenge, and sure to please the more advanced riders. Look for the zone, located skier’s right near the bottom of the park, and easy to spot from the chairlift. FUN FACT: Snowboarding was invented in the 1960’s and started out as “snurfing”. Yes, you read that right. A fellow named Sherman Poppen, an engineer living in Muskegon, Michigan, strapped two skis together and added some rope for steering. His wife called it a snurfer, or snow surfing. Riders have come along way since then. Sun Peaks Resort is 31 miles (50km) from Kamloops. From Vancouver by road, the resort is 235 miles (407 km) from Vancouver. FLY: Sun Peaks is conveniently positioned in the Interior of British Columbia, with two airport gateways – the regional airport, Kamloops (YKA) and international airport, Kelowna (YLW). Many of the major airlines have daily direct flights from many major cities, or direct connections from: Vancouver, Toronto, Seattle, and Calgary, ensuring Sun Peaks is easily accessible from anywhere in the world. View our Sun Peaks_2014-Driving-and-Flight-Map. Air Canada, WestJet, and Central Mountain Air and their code share partners ensure straightforward connections from the USA, UK, Australia and Asia. The resort’s airport shuttle service meets all flights from Kamloops. It usually takes just 60 minutes door to door. If you are flying into Kelowna, shuttles must be reserved 72 hours prior to arrival, as they do not meet all flights. Remember to let them know if children need a booster or car seat. DRIVE: The best, easiest, and most direct route to Sun Peaks Resort is via Highway 5 North, exiting at Tod Mountain Road by Heffley Creek, BC. If you are considering a road trip to take in other ski resorts and the spectacular alpine scenery; Whistler is only 4.5 hours away via Highway 99, some 221 miles (357 km), Silver Star is just 2.5 hours: 119 miles (191 km) and Big White (via Kelowna) is 3.5 hours by road, 168 miles (271 km) . The resort also offers shuttle bus transfers to these three resorts. SNOW HOW TIP: Some GPS providers and Google Maps suggest an alternative access route to Sun Peaks — it is a dirt back road route off of Highway 1 near Pritchard, BC, and Chase, BC. This route is not recommended for winter travel. For the latest information about road conditions, closures, travel advisories and webcams, please visit the Drive BC. SNOW HOW TIP: Winter tyres or chains are mandatory from October 1 to April 30 each year. Winter tyres can be requested for rental cars also. Look for the snowflake symbol on the tyre. Enterprise Car Rental are our preferred car rental company, purely based on positive past experiences, and offering a fleet of vehicles with winter tyres. GETTING AROUND SUN PEAKS: Sun Peaks Resort operates a regular loop shuttle around the resort, from 8.20am – 4.00pm daily, with a scheduled shuttle service every 30 minutes, starting from the Village Day Lodge. Explore the village. TAXI: There is no taxi company in the resort, however Kami Cabs operate from Kamloops and will drive to Sun Peaks. BIKES: Fat Biking is available at Sun Peaks. These bikes are intended for off-road cycling with wider, over-sized tires to handle the snow. Fat biking is only permitted on the designated multi-purpose trails. OTHER GROUND TRANSPORTATION: The Kamloops Ski & Ride Shuttle Bus is available to everyone travelling to and from Kamloops and Sun Peaks, on the weekend. Pick-up and drop off locations are located throughout Kamloops, and no advance reservations are required. Kamloops is also accessible via Greyhound Bus and Via Rail Services. Sun Peaks Snow Sports School has a well-respected reputation within the ski industry. Like all resorts, they pride themselves on the calibre of their snow-pros. The fact that many of the instructors are long-term employees, is testament to a well-run, professional Snow Sports School. Sun Peaks’ terrain is the perfect classroom for all levels of ability — for skiers, boarders and Nordic skiers. If you are a beginner you won’t be intimidated by the easy learning terrain, and you are certain to quickly gain confidence. If you are more experienced, you have an extensive timetable of specialist lessons and camps to challenge your ability. FUN FACT: One of the points of difference we like about Sun Peaks is their unique Race Training Centre, which offers “best in class” training facilities and certified race snow-pros for individuals; snowsports school teams and groups; and elite athletes. Sun Peaks have a vast selection of improvement lessons and programs. Here are a just a few. Guided Gil’s Backcountry Tour Sign up for a private tour of Sun Peaks’ legendary backcountry with a certified ski guide and instructor. Learn the safest routes, best lines, and local secrets while improving your technique in Sun Peaks’ famous dry powder. Suitable for intermediate to expert skiers and riders. Heli-cat Warm Up Camp Warm-up and fine tune your powder skiing technique while developing the necessary backcountry skills before your Heli or Cat skiing destination. The two day camp is designed and instructed by a CSIA certified instructor, Canadian Ski and Heli ski guide. Learn about avalanche awareness, companion rescue, tree wells and backcountry hazards — all invaluable skills to take with you into the trip of your lifetime. First Tracks For those keen to get the fresh power stashes or carve up the corduroy, enjoy an early morning 90 minute session with your snow-pro. Family Fun 2 Day Race Camp Professional race coaching, with a maximum of four per group. Includes video analysis, lift line priority, gate training, Friday Race Series entry, and après party. Super Group Lessons: The Green Scene | Cruise the Blues | Performance Lesson A two hour lesson with a maximum of three students per group with our top instructors, you will take your skiing or riding to the next level. Weekend Freestyle Program Taught by certified Freestyle Coaches, and available for all ability levels teach the fundamentals of Freestyle skiing and snowboarding in a fun and safe environment. The Sundance Childminding Centre is a home-away-from-home for children 18 months to 5 years old. Each day is jam-packed with a mixture of indoor play and outdoor activities (weather permitting). If the kids (ages 3 -12 years) still have energy to burn, then they can now wrap up an exciting day on the mountain with their very own après! Activities include: Scavenger Hunts, Crafts, Movies & Popcorn, and more. SNOW HOW TIP: Best to register in advance for child minding prior to your vacation to ensure availability. We often recommend bringing your own boots, but save the stress of travelling with your own skis and boards. At Sun Peaks you have a great choice of rental gear with more than a handful of different outfitters — providing the latest technology; the best in boot-fitters; and every conceivable accessory and gadget you may need. From skis, snowboards, snowblades to swimsuits and goggles; from wax and scrapers; to t-shirts and boots; from jackets and pants to mugs and batteries, they have it all. Some of the stores are true ski-in, ski-out, which makes it, oh so convenient. SNOW HOW TIP: The Sun Peaks Grand Hotel offer ski-in, ski-out, ski valet and storage, including heated dryers for your boots. 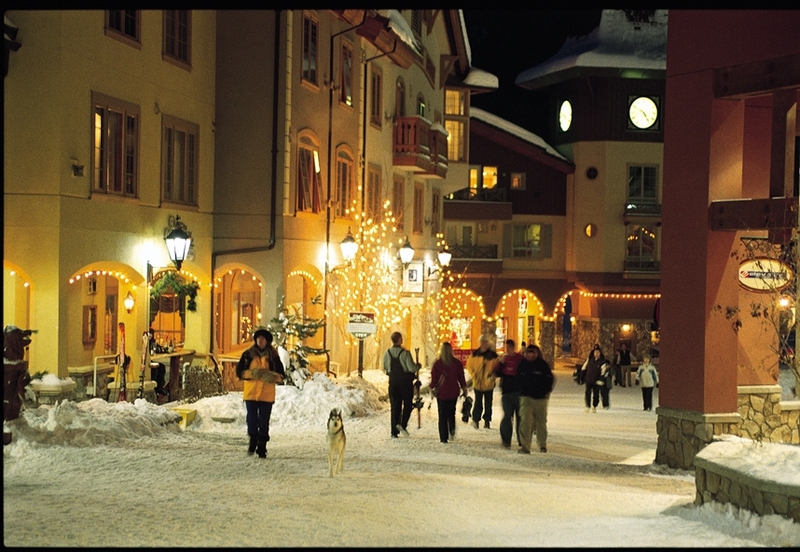 Sun Peaks’ village exudes a European ambience. In keeping with that atmosphere, the pedestrian snowbound village, makes for a relaxing stroll amongst the interesting variety of quaint stores, galleries, restaurants, bars and cafes. Get your sweet fix at the Candy Vault and the Rocky Mountain Chocolate Factory, or browse the Lone Wolf Gallery for local artisan pieces. Of course, you have plenty of choice for sporting and outerwear, souvenirs, along with groceries and a liquor store. The intimate size of Sun Peaks Village, is no barrier to the choice of après ski dining and entertainment options around the resort. The resort is seriously family-friendly — everything from traditional Italian Mediterranean kitchen, to sushi and a steakhouse. Certainly the marque event on the culinary calendar is the Sun Peaks Okanagan Winter Wine Festival which spans 10 days in the latter half of January each year. Enjoy an outdoor BBQ and watch the world go by from the comfort of a sun lounge in the main street of the village. Maybe a sleigh ride through the forest finishing in a fondue dinner appeals? The mid-mountain Sunburst Lodge is the perfect place to refuel, with stunning sweeping views across the mountains. At Voyageur Bistro in the Village, you can savour superb Canadian game, locally themed produce and ingredients; Bison, berries, bannock and local fish are all featured on the menu; paired with award winning local Okanagan wines. The Bluebird Market has a ready supply of all your grocery needs, prepared take-away meals, deli specialties and local produce. Dog Sled Tours Before heading out on your exhilarating dog sled adventure at Sun Peaks, you will learn everything you need to know about dog sled tours in Canada. All sleds are guided. Guests may be given the option to drive the sled, daylight and safety permitting. Sun Host Mountain Tours Sun Peaks is home to some lucky local outdoor enthusiasts, who volunteer to share their local knowledge with visitors. Join a complimentary tour, and get the low-down on the resort’s vast terrain as well as interesting facts and history about Sun Peaks. They’ll be happy to share their favourite secret stashes. Tours depart twice daily for all ability levels. Snow Biking, Fat Biking and Segway Tours Enjoy the fast growing sport of snow bike during your next visit to Sun Peaks Resort. No experience necessary, join a tour led by experienced guides. Suitable only for guests 12 years and older due to the size of rental snow bikes available. Lift tickets are not included, guests are required to provide their own Alpine Lift Tickets valid for the day of their tour. Explore the winter wonderland of Sun Peaks Resort, and enjoy the fresh mountain air on an eco-friendly off-road off-piste guided Segway tour or fat bike. Fat bikes are intended for off-road cycling with wider, oversized tyres to handle the snow. Fat Bikes are permitted on the Nordic trails that have been specially designated multi-use. Ice Hockey Tour This is a must-do evening activity! Get up close to the action with the Kamloops Blazers, the local Western Hockey League team. The resort organizes everything — game day tickets, and transportation to the indoor ice rink in Kamloops. The arrangements allow time for you to arrive at the arena an hour before the puck drops, so you can dine at one of the many downtown Kamloops restaurants. These games sell out, book early. SNOW HOW TIP: Locals always call it “hockey” never “ice hockey”. Guided Ice Fishing Tours Your local guide is certain to deliver a uniquely Canadian experience on one of the many frozen mountain lakes surrounding Sun Peaks. Everything from pick-up to drop-off is included — door to door transportation to and from the lake; a heated ice fishing tent; a hot beverage and all the fishing gear you need. The most valuable part is the knowledge of an experienced guide, making it easy for anyone to learn as they go, with absolutely no experience required. With a little luck and a little skill, you may well catch your dinner. Yes, there is quite a large grocery store at Sun Peaks called the Bluebird Market. I’ve heard Sun Peaks is a wedding destination. Please tell me more? Sun Peaks’ snow-covered majestic mountains will provide the perfect backdrop for your special day. Create a celebration that captures the ideal blend of nature, romance and sophistication. Exchange your vows high in the hills at the resort’s mid-mountain chapel; or on the mountainside with the snow beneath your feet; or at one of the European inspired hotels or lodges. It’s all about the two of you, so choose a venue that is the essence of you. Wedding planners are available in-resort. Sun Peaks Resort has achieved an array of well-deserved accolades. Here are a few that affirm this resort is such a favourite for guests from all corners of the world.